If you love British culture and want to explore some of the English countryside, we highly recommend the Magna Carta which cruises on the vibrant and lively Thames River. When cruising with them, we were delighted to walk from the barge to the Hampton Court Palace, most famous as a residence for Tudor monarchs and their consorts: Henry VIII, Anne Boleyn, Jane Seymour, Catherine Howard, Edward VI (Henry VIII’s short-lived male heir), and Mary I and Elizabeth I. 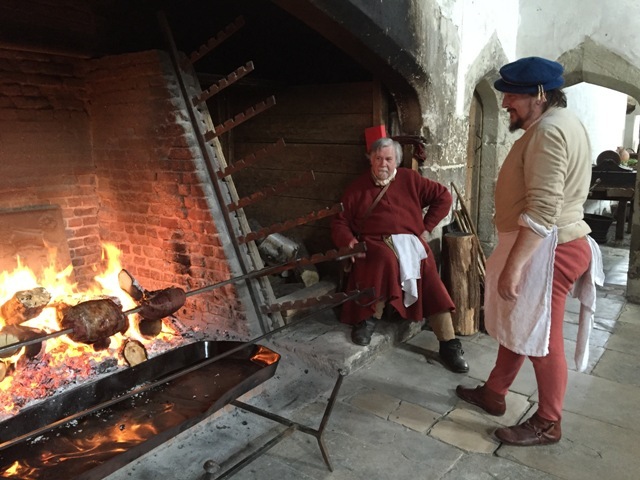 What are some of the highlights of Hampton Court Palace? The Great Hall of Henry VIII This huge medieval hall once featured William Shakespeare’s acting troupe where they performed in the early 1600s. These were built to feed hundreds of people every day, of course without any modern appliances. How did they do it? Step into the kitchens and find out. You may also be able to catch a live cooking event. Will you be able to find your way out from among the intricate hedges? The maze, by the way, wasn’t Tudor. It was conceived later on during the reign of William III. Don’t miss out on exploring the splendid formal gardens and parklands that surround the palace. You’ll come across deer and birds, fountains and ponds, sculpted trees and a wide variety of flowers in breathtaking settings. Contact Beth today for more details about traveling through England or other beautiful European waterways by barge. England is steeped in history (as well as tea! ), and nowhere is that more evident than when navigating the waters through which that history has flowed. We believe that one of the best ways to become steeped in that history yourself is by taking a river barge cruise aboard the Magna Carta on the Royal River Thames. Aboard the luxurious, eight passenger Magna Carta, you will enjoy both the elegance of a bygone era and the comfort of modern conveniences. Built in 1936 of mahogany, teak and oak woods, the Magna Carta includes such modern amenities as under floor heating, a spa pool and modern, ensuite facilities in its spacious 200 sq. foot staterooms. The barge is also outfitted with amenities such as WiFi internet access and touring bikes that you can use to meander along the Thames footpaths. The upper deck includes a salon in which you can sample a wide variety of wines, as well as the dining room, where the master chef will present you with succulent local dishes including roast guinea fowl, rack of lamb, breast of duck, and traditional English cheeses. Magna Carta moored for a night’s rest along the Thames. Photo courtesy of WAVEJourney.com. While enjoying the lovely English countryside from the comfort of your floating country hotel, you will meander past quaint riverside villages and historic royal palaces. Your trip begins with an English cream tea to properly prepare you for your idyllic waterway excursion. In addition to river views of the fabulous waterside houses of Bray, there are carefully planned side trips to points of interest such as Hampton Court Palace, Windsor Castle and Windsor Great Park’s Saville Gardens. From the ancient village of Hurley with Ye Olde Belle, England’s oldest inn, to Cookham, which hosts the painter Sir Stanley Spencer’s gallery, to the River and Rowing Museum at Henley, you will find a wide array of sights and sounds to please all of your senses. The main street of Henley-on-Thames. Photo courtesy of WAVEJourney.com. So come steep yourself in tea, history and idyllic English countryside. Contact us to sign up today for your cruise on the Royal River Thames!